After a magical journey in India, Elsie Johnstone reluctantly prepares to head back to Australia. Traveling in India has altered her understanding of the country and its people, and forced her to question her own beliefs. In her last article from these travels she looks back on an enchanting trip. This morning our guide, “call me Vee Pee” arrived and we made an early start so that we wouldn’t be out in the midday sun. This was the penultimate day of our holiday and what a holiday it has been. We have enjoyed every last minute of it, learnt a lot about India and its people and questioned our own belief systems. They say “you cannot come to India and not be changed forever” and this is definitely the case. Udai Kothi is located in the old town so we set out on foot to watch the people go about their lives. “Have people got washing machines in their homes?” I asked as we watched a group of ladies washing their clothes in the lake. A father was teaching his young daughter how to slap a cloth against a rock. We stop at the Hindu temple in the middle of town where the old grey haired women are sitting cross-legged before the altar chanting and praying. “They now have time as they are finished with their work lives. They come each day to give thanks for the lives they have enjoyed and to ask for guidance when they begin their journey to the next phase of existence,” Vee Pee informed us. 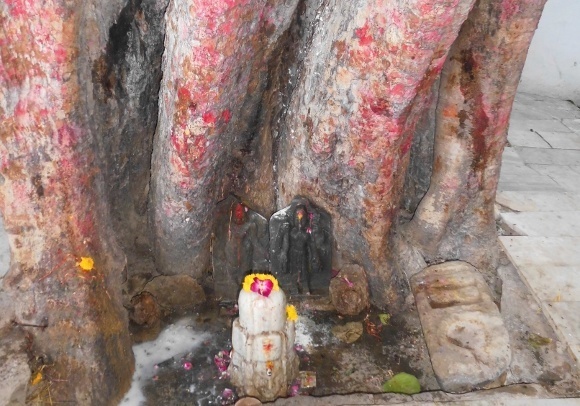 The six hundred year old white marble shrine is intricately carved with Hindu symbols. When viewed from the front, all Hindu temples are constructed in the form of a person sitting cross-legged on the ground, for that is when a person is in perfect balance. Each day we find out so many interesting things about the oldest form of worship. We walk up the hill to the royal palace of the longest enduring dynasty in the world, dating back to the early sixteenth century. We spend the next two hours climbing up and down stairs. Vee Pee warns “Mind your head” as we cross each short door. “Were the people particularly short?” I asked. 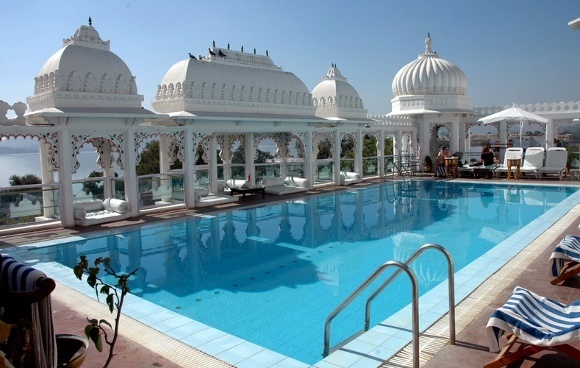 This splendid example of a Maharajah’s palace gives excellent views over the very beautiful Lake Pichola and mountains. Udaipur is situated on five man-made lakes storing the monsoonal rains that have been used as water for the last six hundred years. To top off the morning we take a boat trip on the lake where we can view the beautiful city from another angle. Today we are going home. What a wonderful trip it has been! How lucky were we to stumble across Enchanting Travels. They organized the whole trip from go to whoa without a single faulty step. We were impressed when they phoned a couple of days after our enquiry. We are more your cultural types who like to stay a day or two, get a feel of the place and see the locals going about their daily lives. We go to see monuments and such but if you ask me I will tell you that the Taj Mahal in Agra may be magnificent but the Indian people are even more so. India is about the people you meet, the sights you see, the culture you are immersed in and the traditions that stretch back in time. The hotels we stayed in while traveling in India, were all fantastic in their individual ways. The old palaces and grand buildings may have steep stairs and certain inconveniences that come with antiquities, but they offer charm and grandeur, along with attention to service that only India can give. Before we made it to the airport we stopped off at an 11th century Hindu temple. Many of the carvings were still intact showing that people were not so different then as they are today- representations from the Kama Sutra featured on may panels. Then we were off to lunch at the grandest Palace of them all – the RAAS Devi Garh, Delwara. Set low on a hill among the mountains, this restored palace offers both luxurious accommodation and fine dining. We were there for lunch. What a treat! So it’s goodbye to traveling in India. Our biggest thank you must go to our very patient and competent driver, Anil, who not only took us safely but was an absolute gentleman in every respect. We greatly admire his professionalism and integrity. May all his dreams come true! Thank you to ‘Enchanting Travels’. What an amazing company! Our driver and guides were all proud to tell us that “Enchanting India is a very young company that was started from scratch only seven years ago by a German and an Indian from Bangalore who were passionate about Bangalore”. They saw a need and set about providing a service that cannot be faulted. We would love to welcome you to India and enchant you! Take inspiration from some of our sample trips here, or call us!